Lots of families have family reunions in the summer. Relatives come from all over for picnics, games and to reconnect. There are lots of ways you can use banners and signs at your family reunions. 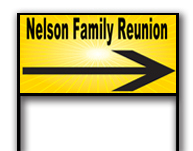 You can use yard signs to direct people to the location of your family reunion. This is helpful for out of town relatives to prevent them from getting lost. Yard signs can be placed along the road at intersections so they are easy for people to see. If you use yard signs, make sure the letters are large enough for people to read while they are driving. There are lots of pictures taken at family reunions. Banners can be used as a backdrop for the photographs. You can add the date and location of the family reunion on the banner so you will remember when you look through the photographs later. It's easy to get custom family reunion banners and yard signs. We have family reunion templates build for you to customize, or you can design your own by adding backgrounds, photographs, clip art and text. You can also upload your own files or work with one of our graphic designers. Click here to get started on your Family Reunion Banners.